Wow such a beautiful building with a great story to tell! I recall my grandmother having a friend in King's Daughters when I was growing up in the 1980's and early 1990's, and I was always curious about visiting the house because it was so elaborate looking. I'm glad to see it's been fully restored and is still being put to good use! You have really outdone yourself! What a marvelously in-depth post! LOVE IT. My brother had a paper route in the late 50's which included the "King's Daughters Home." I remember delivering newspapers here and attempting to collect the subscription fees. We never knew anything of the history of this building and the people who lived there. Thanks for bringing back memories and for filling in those historical gaps. I hope the Crossmans have plans to install some planter boxes at the front- those empty brackets could use them, even thouhg they've been bracket-less for 50 years. Nice to see that this one has survived! Great history too, as usual. Great story. In 2006 I visited the estate sale at Kings Daughter's Home, and I purchased a counsel piano that was made in the early 1900s. I wonder if it is the same piano mentioned in your story? That first home was quite handsome for the purpose and times. By coincidence, I attended a meeting in one of their conference rooms Thursday night - wonderful people and the place is absolutely beautiful inside. Those ladies in 1946 look comfortable in their Kings Daughters surroundings; peaceful, happy, secure, occupied, content, and proud of their home. I am sure that is what Brodie Duke and the other benefactors intended. Think of what they had lived through. Their parents were alive during the Civil War. Wouldn't you like to hear an afternoon's conversation? 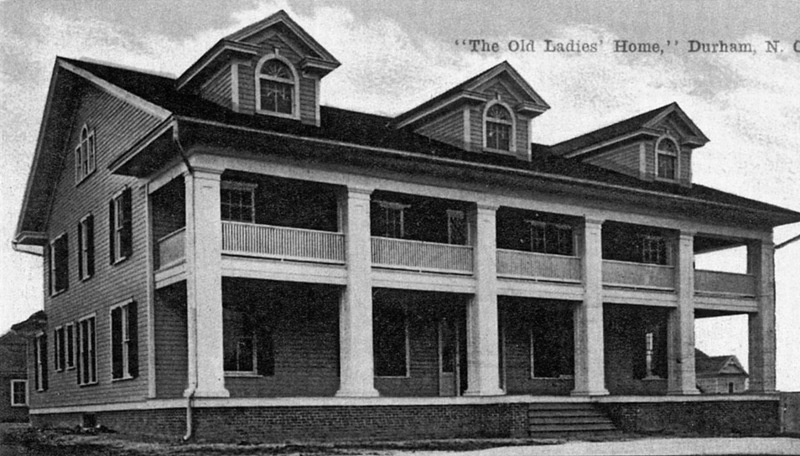 "Old Ladies' Home", ~1910, looking northeast from Gloria Ave. The International Order of the King's Daughters and Sons, per the organization's website, was founded January 13, 1886, as "an organization of Christian men and women dedicated to service in Christ's name [and] the development of spiritual life and the stimulation of Christian activities." 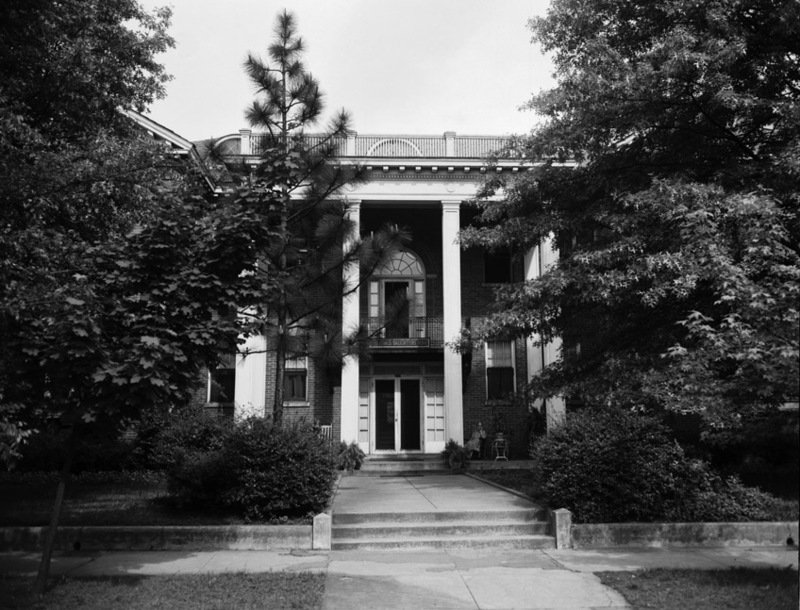 A chapter was first organized in Durham in 1890; early efforts (beginning in 1892) included advocacy for the establishment of a hospital for Durham, which would be realized with the construction of Watts Hospital in 1895. Smoky Hollow - the neighborhood heir of Prattsburg, located in the low ground east of present-day Elizabeth/Holloway St. - had been a source of public hand-wringing for the Durham establishment, particularly from the women of Durham's prominent churches . Much of the concern seemed to focus on delivering the "soiled doves" (i.e. women engaging in prostitution) of Smoky Hollow from their unfortunate fall from grace. 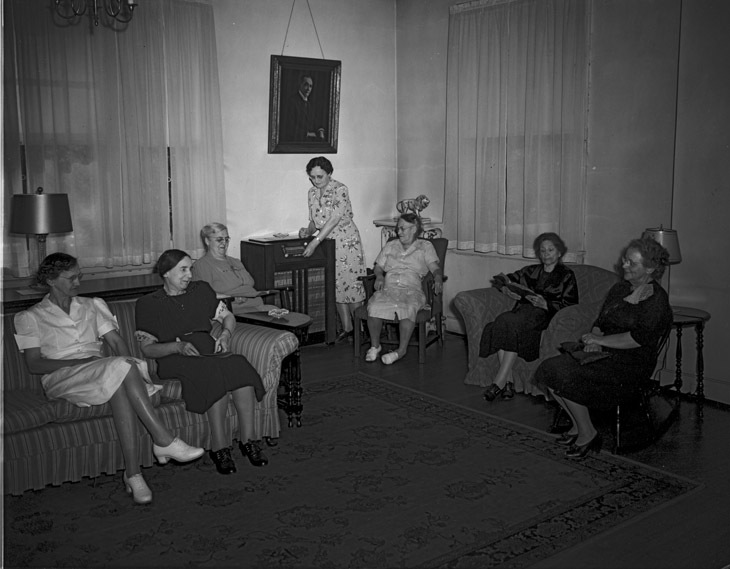 A new chapter (called a "circle") of the King's Daughters was established on January 3, 1903 in the "home of Mrs. MB Wyatt" of Cleveland St.; it would be known as the Sheltering Home Circle. It was comprised of 16 women (two from each of eight churches.) Their immediate concern was to establish a home for the "unprotected girls" of Smoky Hollow. (Which I find interesting and curious, as Smoky Hollow-as-place was obliterated by Julian Carr in 1900-1902 with the construction of Golden Belt and the Durham Hosiery Mill No. 1.) They also established a campaign on July 4, 1903 to provide "ice for the suffering poor" by placing collection boxes in local retail establishments - the first time this later-ubiquitous collection method had been done in Durham. They also established an "Exchange" - wherein the Circle established a shop/store where handicrafts and baked goods could be sold to raise money for the organization. Not long after the campaign to save the women of Smoky Hollow began, the Sheltering Home Circle changed their plan. Whether they were unable to raise sufficient money for the chosen cause, the problem of Smoky Hollow seemed 'solved', or, as Jean Anderson states - "wiser heads persuaded them that they were not suited for this endeavor" - is unclear. Having changed their choice of charitable aim to the provision of a home for elderly women of meager resources, they found a new patron: Brodie Duke. The catch-all destination for the impoverished, mentally or physically disabled, or criminal at the turn of the century was the Durham County Poor house. While the aim of the King's Daughters was to provide charity to all of the "unfortunates" of Durham, one can imagine that their sympathies would be particularly triggered by the notion of an elderly "worthy" (to use their term) widow who, due to certain circumstances would find her lot cast with the other residents of the Poor House, who perhaps, in the view of the King's Daughters, did not possess an equivalent moral rectitude. Brodie Duke, who owned most of the land that would become Trinity Park, found his sympathies so triggered. He donated a 178 x 150 foot piece of land on Guess Road (later Buchanan Blvd.,) facing the Trinity College campus, as well as $500. The frame structure, sketched on a piece of paper by Lucy Lathrop Morehead, transformed into architectural drawings by Durham architect Hill C. Linthicum, and built by contractor John T. Salmon, was completed in 1911 at a cost of $8500; it could accommodate 16 residents. Immediately after opening, it housed 5 residents, a cook, and a "matron." It was, in the bluntly descriptive style of the time, referred to as "The Old Ladies' Home." The cost to residents was $15 for a single room or $10 for a double room. Board, personal care, and laundry service were included. The matron was paid $10 a month; the cook was paid $2 a week. The home cost $26 to run in its first month in operation. Although the home was certainly a charitable endeavor, with the King's Daughters ongoing fund-raising efforts supporting much of the operational cost of the home, it was not charity without expectation; women were (variably) evicted for their inability to pay rent due. However, the King's Daughters lavished what funds they could raise upon the home; in 1913, they purchased a $100 piano for the home - the same amount they spent on all other charitable endeavors that year. Duke purportedly called the intersecting street at the corner "Gloria" because of the "glory at aiding such a worthy cause." The cause that had been deemed not-as-glorious, shelter for women engaged in prostitution, was taken up by the Salvation Army, who provided such shelter at their building on Morris Street near Five Points. The home was soon at capacity, and demand for additional rooms was such that the King's Daughters commenced fund-raising activities to build a larger home in 1922. They held an annual bazaar to raise funds; Brodie Duke had died in 1919, but his brothers Ben and Buck gave $35,000 to the building committee. Another $20,000 was raised from other sources. In 1925, the organization commissioned a masonry Colonial Revival structure, designed by prominent architectural firm Milburn and Heister, which replaced the older structure. (The younger Milburn, Yancey, likely had a stronger hand in the design and execution than his father Frank, as he had taken residence in Durham during M&H's most prolific years of Durham design.) The old structure was "sold at auction." (I don't know if it was dismantled or moved.) During construction, the home used a "large house at the corner of Duke and Markham" as a temporary home. 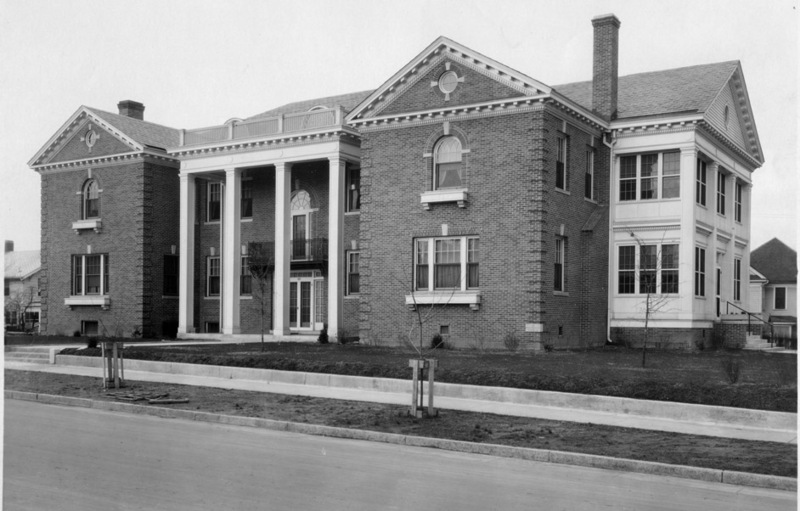 The new structure, designed to house 36 women and staff, built by CH Shipp's Consolidated Construction Company, opened on January 1, 1926, and had 35 bedrooms, living room, dining room, kitchen, pantry, and an infirmary. The King's Daughters in Durham remained an active organization throughout the early 20th century, partnering with other organizations such as the Salvation Army, Associated Charities, the Elks, and particularly with the Children's Home Society of Greensboro to provide charity. They adopted a practice of so-called "friendly visiting among the poor" to determine if families with particular needs were "worthy" of assistance. (Worthiness seems to have been judged by whether 'moral transgressions' had contributed to the family's situation.) These visits were often made to the mill communities: West Durham, Edgemont, Commonwealth, and Pearl Mill. The King's Daughters would sometimes, with the help of the Children's Home Society, attempt to remove children from what they felt were unfit and unsafe circumstances for the children, to place them with “good Christian homes.” They also worked with unmarried pregnant women, often very young women, to find homes for them to stay in when they had been rejected from their own. They also took on the difficult task of trying to punish, or at least hold responsible, the men involved; they had worked in the 1890s, successfully, to raise a girl's age of consent from 10 years of age to 14; in 1910, they worked to raise the age of consent to 16, unsuccessfully, and sought to have the county enforce so-called "bastardy laws." Broadly, the state of social welfare began to change (for the better) over the course of the mid-20th century, with a very gradual destigmatization of many of the circumstances that would have left a woman or a child deemed "unworthy" decades before, and the growth of a more robust county, state, and Federal-provided social service system. The King's Daughters' attention focused more squarely on the operation of the home on Buchanan Blvd. Use of the home continued to grow over the early to mid 20th century, prompting interest in expanding the facility by the 1950s. In 1955, the Circle built an annex on the north side of the building, designed by architect George Hackney, which provided 12 additional bedrooms, an elevator, and an auditorium. At its peak, the home accommodated 34 women and 9 live-in staff. Over the latter half of the 20th century, patterns of care for the elderly changed, though, and, by 2006, only 3 women (and nine staff) remained. The Board made the decision to close the home and decided to sell the property. [t]he restoration of wood details and windows, plumbing electrical updates, removing layers of Astroturf and other nonhistoric materials. The most dramatic transformation occurred in the front-entry, where a decades-old, two-story firewall was removed and the stairwell restored to its original configuration, based on an early photo and physical evidence. Public spaces were painstakingly preserved, while generally, pairs of rooms were combined to make a single suite with a private bath. To preserve the rhythm of the hallway openings, extra doors were sealed rather than removed. Transoms were fixed to meet code, but hardware was left in place for aesthetic and historic reasons. In the large unfinished attic, Deanna Colin envisioned a loftlike living space for themselves that celebrated the riveted steel structure of the building. Bedrooms and bathrooms were constructed at each end of the space and an interior stair was extended to provide access to their new living quarters. As a celebration of the building's history, each suite is named for a former resident or major supporter. Further, a mural was painted along the walls in the 1955 addition as a tribute to the King's Daughters. Thankfully, some furnishings from the original parlor, that had been sold when the residents moved out, were returned after the renovation was complete. The renovation evidently also added a 10,000 gallon cistern and a rain garden to collect roof storm water run-off. The newly-christened King's Daughters Inn opened on April 18, 2009, and by all accounts I've heard, it has been a great success.